Magnets are supposed to be fun — they decorate the refrigerator, teach kids about science, and help us stick things to blackboards. What they aren’t supposed to do is get themselves swallowed, but a dangerous pattern is emerging among children and sucking the fun right out of the tiny toys. 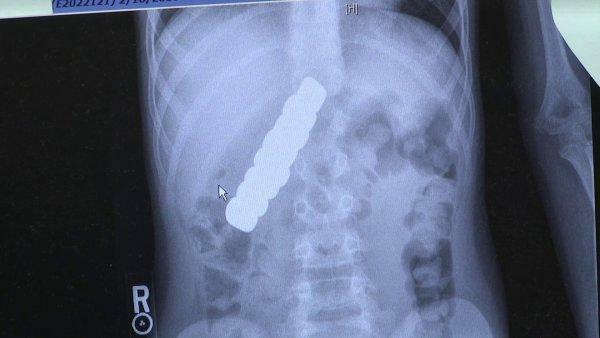 Brady Westphal, a 10 year old from Oklahoma, fell victim to this trend, swallowing a handful of magnets. “This is a line of eight, exactly how many Brady swallowed,” the boy’s mom, Peggy, told KFOR. Doctors said the magnets ripped through Brady’s stomach and intestines, tearing a damaging path through his entire abdomen. It may sound like a freak accident, but this is a situation doctors at the Children’s Hospital at Oklahoma University Medical Center have seen twice in just a few weeks. Brady’s original symptoms resembled those of a stomach flu, so officials are warning parents to be vigilant. Brady and his family are just thankful to be back at home with their son recovering.